“For it was indeed fitting that we should have such a high priest, holy, innocent, unstained, separated from sinners, and exalted above the heavens” (Heb. 7:26). The Levitical priesthood was only a temporary solution to the problem of sin. Though God accepted sacrifices as a means to cover sin, the old covenant priesthood could not make anyone perfect (Heb. 7:1). The sacrifices were instituted for a time in order to demonstrate to people their need for a perfect priest from the order of Melchizedek (Ps. 110). Jesus, our High Priest in the order of Melchizedek, is able to save to the uttermost those who draw near to God through Him because He always lives to make intercession for them (Heb. 7:25). But this work of intercession is not the only thing that enables Christ to save us. Christ’s nature as a “holy, innocent, and unstained” priest also makes Him able to perfect us where the old covenant could not (v. 26). Today’s passage opens with the idea that it was “fitting” for Christ to be a certain kind of High Priest for us. The word “fitting,” while an acceptable English translation, does not convey all that the author intended in this verse. The idea here is that Jesus, by being holy, innocent, and unstained, answers exactly the predicament that mankind finds itself in. God requires us to be holy, but we, because of our sin, are far from that state. Christ, however, is holy, and if we are in Christ we are also counted as holy, innocent, and unstained. John Owen makes many helpful remarks about this verse. 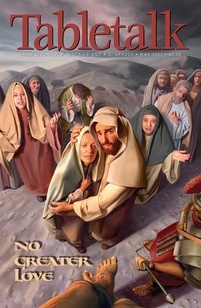 He says that being holy means that Christ “does not have any sin present with him as we have, neither is he entangled in sin.” Owen also says that being innocent means that Christ “does no evil” and that being unstained means that Christ, in every way is “unpolluted” and “undefiled.” Unlike our thoughts and deeds, which are in every way tainted by evil, Christ is completely free from the stain of sin. The salvific benefits of the covenant are given only to those who are perfectly righteous and holy. Christ had to be these things so that the Father, by counting Christ’s righteousness as our own, could bless us with salvation. Thus, verse 26 also tells us that Christ is “separated from sinners.” This is not to say that Jesus was not truly human. For in our humanity, as originally designed, Christ is just like us. But unlike us, His human nature never became corrupt. He never sinned, and, thus, He could fulfill the requirements of salvation. He had to be separate from us in perfect holiness so that we could receive His perfect righteousness. If we had to fulfill the requirements of God ourselves, we would never make it. Only because we can be counted righteous through faith in Christ do we have any hope of avoiding the punishment for our sin. Are you sure that you are counted holy only because of Christ or do you think that there is something that you can do to earn your salvation?